Discover unexpected values on top-quality products and everyday items for your home and family at Kmart. Kmart carries popular brands for a wide array of products including grocery, health & beauty, apparel and shoes for the whole family, toys, lawn and garden equipment, pet supplies, small appliances and much more. Kmart gift cards have no fees and never expire. They are redeemable for goods and services at over 1,500 participating Kmart and Sears® retail locations in the U.S. and online at Kmart.com and Sears.com. 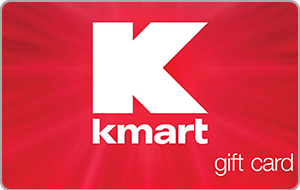 The Kmart Gift Card is issued by SHC Promotions, LLC and is redeemable for goods and services at participating Kmart and Sears� retail locations in the U.S. and online at Kmart.com and Sears.com. It is not an in-store offer, nor a sponsor of this promotion. Fulfillment of gift cards will be done through InComm Digital Solutions. Not valid for purchase of third party debit or prepaid cards. Not redeemable at restaurants, portrait studios, or for cash, except where required by law. Cannot be applied to credit accounts. Lost, stolen or damaged gift cards may only be cancelled and replaced with proof of purchase. Protect this card like cash. Kmart Gift Cards are subject to all terms and conditions printed on the Gift Cards and are subject to change at SHC Promotions, LLC�s discretion. Use of the card constitutes acceptance of these terms. � 2014 SHC Promotions, LLC.